A factory publicity photo from late in 1947 shows a cutaway view of the Reflex's focusing and film wind systems. Late in 1947, it appeared that the American photo industry in general, and the domestic TLR in particular, had carved out a permanent niche in the marketplace. With the German competition still struggling to get back into production and Japan little more than a place for General MacArthur to hang his hat, the time seemed perfect for some enterprising company to introduce a state-of-the-art machine: something to fill the temporary void left at the top by the postwar absence of Rolleis, Ikoflexes and Voigtlander Superbs. Ansco, one of America's oldest and most prestigious camera makers, decided to be that enterprising company. The secret to success in a venture of this kind was to establish a supply network and a superior reputation before any serious competition appeared. As it happened, Ansco was still working the bugs out of the Automatic Reflex in 1948 when the Rolleiflex Automat re-entered the American market. Unlike Ansco, Rollei hit the market running, with an established, debugged, well respected prewar design - and the Ansco Automatic Reflex joined the Kodak Ektra and the Bell & Howell Foton as a noble but unsuccessful attempt to establish America as the world's leader in premium photographic equipment. Unlike some later (and more successful) TLR's, the Ansco was not a slavish copy of an established German product but a unique and original design, incorporating most of the best features of the premium machines of its day, adding a few of its own, and intentionally deleting some features which were, in the view of Ansco's designers, mixed blessings. 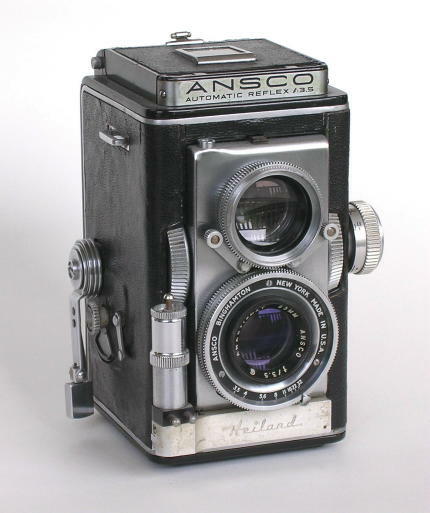 Ease of operation was a prime consideration in the design of the Ansco reflex. Although it handled quite differently from a Rolleiflex, it was equally comfortable in use. No fewer than three focusing knobs were provided: a thumbwheel protruded at each side of the focusing panel, while a removable Rollei-style knob on the left side carried the footage scale. Immediately adjacent to the thumbwheels were a pair of identical levers for shutter cocking (on the left) and release (on the right), which fell naturally under the thumbs when the camera was cradled in both hands in normal waist-level operation. It was a most comfortable and secure arrangement, and it allowed for refocusing without losing one's grip. The film advance crank was a non-folding type, somewhat shorter than the Rollei's folding crank. It was fully ratcheted and had no particular parking position, so its 280 degree throw could be executed in whatever manner was most comfortable for each user; it was not necessary to 'backpedal' the crank after winding as it was with other TLR designs. 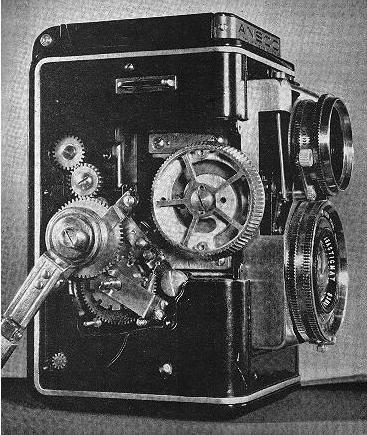 Ansco's designers chose to separate the shutter cocking and film advance functions so that the film could be advanced immediately after each exposure (the usual practice, and good for film flatness) without leaving the shutter springs tensioned for extended periods of time. Film transport was, however, coupled to the shutter release for double exposure prevention, and on the Ansco, unlike most others, this feature could be manually overridden for intentional double exposures. It was this mechanism that was responsible for most of the mechanical difficulties that plagued the Automatic Reflex, as it occasionally locked the camera up and prevented not only double but single exposures as well. The problem was so common in early production that Ansco's own engineers recommended use of the double-exposure lever as an unjamming device in case of "improper manipulation" on the part of the user. Ansco also provided a dummy roll of film with each camera so new owners could practice "proper" manipulation. Ansco's PR people made much of the relatively long 83mm focal length of the Automatic Reflex's taking lens. Company propaganda notwithstanding, however, this was done not to increase the image size on the negative (by a breathtaking 10%) but to reduce the angular coverage required of the lens. In order to compete with the corner-to-corner sharpness of the Zeiss Tessars in the better German imports, Ansco would have had to incorporate an expensive 4-element Wollensak Raptar lens; but by increasing the focal length to 83mm it became possible to cover the 2 1/4 square negative within the angular capacity of a triplet. One of relatively few cost-saving expedients in the Reflex, the same tactic had been used in both the Ciro-Flex and the Kodak Reflex, and while not admirable it was adequate. The optical performance of the Reflex compared favorably with anything in its class, and Ansco even managed to score a few points on its 'larger image' without ever having to admit that they'd saved money in the process. Two other design decisions at Ansco can be attributed to economic considerations: the first is the absence of automatic parallax compensation in the viewfinder; the second is the lack of an automatic first-frame registration device similar to Rollei's. Considering the trouble they had with the film advance system as it was, perhaps it's just as well that they didn't attempt the latter. Parallax correction, though, would have been a wise addition, particularly as the Ansco's full-size Rapax shutter required greater spacing between the lenses than was necessary in the Rollei, which used a special miniature Compur built for TLR applications. A neat trick that Ansco did include was a viewing screen ground in a circular pattern rather than the usual random sandblast texture. A less effective predecessor of the Fresnel field lens, this device did offer somewhat improved brightness in the corners of the screen. The viewfinder also sported the first easy-to-use focusing magnifier, which popped into place at the push of a button, a simple but appreciated feature; and the eye-level sports finder, rather than being a simple square hole in the hood or (worse) a mirror giving an inverted view of the screen as in Rolleis, was a genuine Galilean optical viewfinder of generous proportions. For all its high quality and intelligent design, however, the Ansco Reflex found itself out of its depth almost immediately upon its introduction. Priced at $262.50 in 1947, it met head-on with the $265 1948 Rolleiflex Automat; by 1949 the Ansco was being closed out at $145. Like the Foton, the Ektra and others, Ansco had made a bold attempt at greatness�.. and failed.